Adam Ross of Mindshare is seeing red after attending a presentation from Adconion Media Group’s branded entertainment division, RedLever last month. 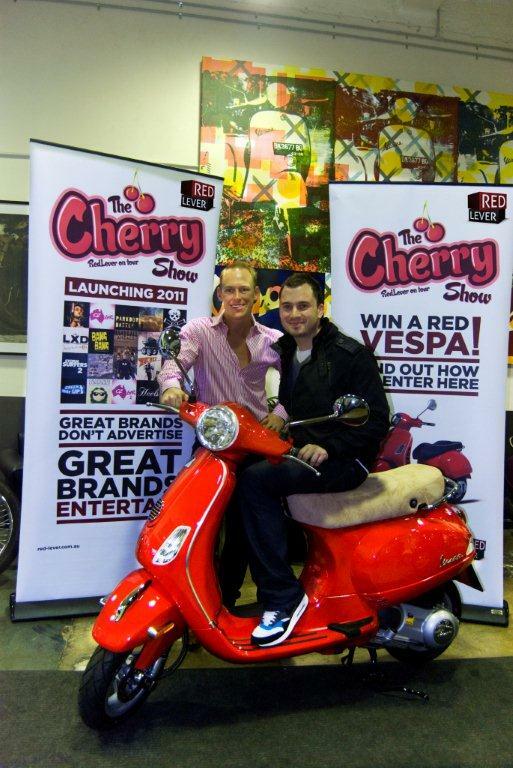 Ross, who is the Director of Strategy, Co-creation for Mindshare, is now the proud owner of a shiny, cherry red Vespa. The Vespa was presented to Ross this week by RedLever Managing Director, Sam Smith. Ross won the fiery little roadster as the result of attending The Cherry Show, an agency tour recently staged by RedLever to showcase the value of its branded content and entertainment productions. RedLever is a wholly owned division of Adconion Media Group with offices and facilities in Sydney, London, Los Angeles and New York. It is a branded entertainment and digital creative production house that specialises in sourcing, developing and negotiating funding/sponsorship and distribution arrangements for high quality, entertaining content. RedLever’s services combine all the disciplines of traditional broadcast production with digital content and distribution strategies to help advertisers target the growing numbers of online audiences seeking information, entertainment and engagement from leading brands. RedLever locally has created unique online content and campaigns for Vodafone, Westfield, Landrover, Sprite, Johnson & Johnson and Paramount. Adconion Media Group is the world’s largest independent content distribution and monetisation platform, reaching 325 million unique users – or one-quarter of the total global Internet population every month.